This full day tour includes enjoying many of the beautiful sights Sedona has to offer, highlighting Sedona’s famous rock formations. Your guides will allow you to experience the area as seen through the eyes of an hourglass, peering back in history and time. Examine Native American civilizations, early homesteading, Scenic Sedona, the Colorado Plateau. 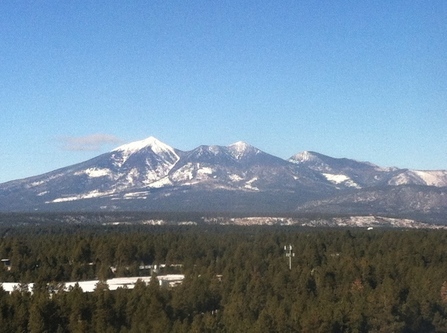 Once in Flagstaff, you will get a scenic tour of this beautiful college town, home to Northern Arizona University. Depending on your personal interests, consider a visit to the Museum of Northern Arizona, which has many fascinating exhibits about the southwest; a tour of Lowell Observatory, where Pluto was discovered; a walk around historic Downtown Flagstaff; or we may take a scenic tour around the San Francisco Peaks (including Arizona’s highest point, Mt. Humphries) to enjoy spectacular views among the Ponderosas and Aspens. This is a full day tour includes many different options based on your own personal interests with several choices of educational stops. This is an all-inclusive tour, which includes lunch, dinner, and admission to the Museum of Northern Arizona, admission to Lowell Observatory, Arizona Snow bowl’s “Scenic Skyride” (summer, weather permitting) and delicious beverages/snacks throughout the day.